If you have ever downloaded files from the internet, you would have come across archive files. There are so many different formats, such as .zip, .rar and .ace and even some strange sounding ones, like “tar” or “gz”. The problem when you receive these files is how do you open all of them? As files are rapidly growing in size, file compression has become an essential tool for every computer user as it makes a compressed version of the file that is considerably smaller than the original size. As the overall file size is reduced, you can transmit your files faster over your internet connection, take up less space on your computer or become more transportable to suit your busy lifestyle. Most files created by computers contain loads of redundant information. This is information that is repeated over and over again which takes up unnecessary space. FileSquasher users specially made algorithms to get rid of all this redundancy, so instead of having the same information listed over and over again, it is listed only once and referred back to if needed again. The same applies when you use FileSquasher to 'unpack' a file. It simply resets all the redundant information back to it original state, creating a 'loss less' archive solution. The best part is that FileSquasher has been makes all this happen behind the scenes. You simply need to point and click to compress your files. FileSquasher does the rest! Imagine a program that can deal with different file formats in 2 simple steps. Click on the file and unpack it. Ideal for emailing large files. Pack multiple files together to save space. Have you just been on a great trip and want to share your memories? Digital cameras are great, but the files can be large and sending them to people can take hours. To save frustration from the person your are sharing your memories with, simply use FileSquasher to pack all your files together in one easy to send far smaller and compact file. The person you just emailed simply clicks on the file and it automatically unpacks everything onto their computer, ready for them to view like normal. Automatically zips files and adds them to your email..
Have Files You Must Keep Private? With computers now mainstream everyone has private files that they don't want prying eyes to view. Be this bank statements, credit card numbers, passwords all those private files you can't let others see. FileSquasher allows you to pack these together in one password secure file. You can even stop people from seeing what you have in your 'special file'. Even better you can take this private file with you and open it on another computer. File Squasher uses the Advanced Encryption Standard (AES-256). This encryption is so strong that the US Government has rated this as suitable for TOP SECRET information and national security systems. Supports the 256-bit AES cipher encryption. Encryption can be enabled for both files and directory structure. Just spent hours downloading a large file that does not work? Want to share your files with others? Pack all your files together as a self-extracting archive. Stop buying specialist programs, FileSquasher unpacks them all. You can save storage space. By compressing large files can save up to 80 percent or more in hard disk space. Send your emails quicker. A smaller sized file decreases email sending time. Save on space in your mail account. If your mailbox has a space limit, you can store more as the email messages are smaller. Send private messages safely. Simply encrypt the attachment and send it. Only a person with the correct password can open it. Create files anyone can unpack. Use the self-extracting archive feature to create a .exe. Anyone can open it, even if they do not have File Squasher on their computer. Winner of the 2007 community choice awards for "Technical Design" and "Best Project"
No costly yearly subscriptions, never pay for updates again. 100% FREE updates / upgrades. Never pay for an update again, Every update is always 100% free. Don't you hate it, having to purchase a 'license' for a software program again and again and again. You already have so what is the need to pay for it? This is why you only have to pay for FileSquasher once. From now onwards you will always receive the latest version 100% free. We are so confident that you will love this software that we offer a 100% no questions asked 60 day money back guarantee. That's right, we know you will love this software so much that you can try it 100% RISK FREE for up to 60 days. If you aren’t satisfied for any reason, or it doesn’t live up to your expectations, you won’t be out at all. Just send it back and we will refund the purchase price. Right up to the final day of this 60 day guarantee. FileSquasher is a Web Entrust Trusted Site, so you know you can order from at any time in full confidence! The fastest way to order is directly online with our secure 3rd party retailer - Clickbank . With Clickbank your financial information is protected with industry-leading security and fraud prevention systems. Purchase with confidence and security. 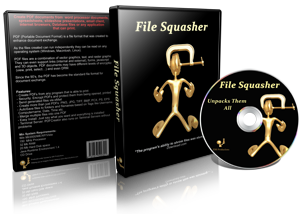 Be on your way to using the File Squasher Software Package, within 5 minutes. Remember File Squasher comes with 100% FREE updates / upgrades. All The Unadvertised Bonuses Now! For $97 $67. . .
DO NOT hit the "BACK" or "CLOSE" button after you pay for the item. You will be redirected to the secure member's area! Remember, if you aren’t satisfied for any reason, or it doesn’t live up to your expectations, you won’t be out one red cent. Just send us an email and we will refund 100% of your payment. Right up to the final day of this 60 day guarantee. P.P.S. - FileSquasher has been created with you, the end user, in mind. The simple and clean user interface will have you sending files like a pro in a matter of minutes.